Please note these fun figures are 1/2 to 2 inches tall and come in commercial grade packaging with no fancy box. 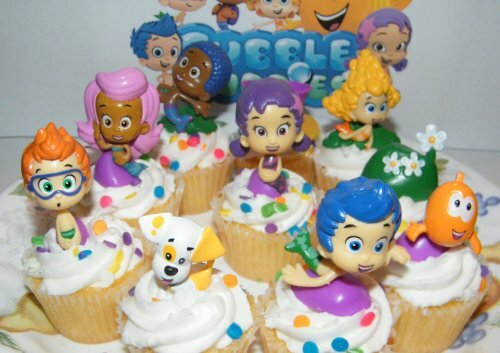 This listing is for 10 colorful cake/cupcake toppers from the popular Nickelodeon Bubble Guppies children's show! These nicely detailed figures will help make your cake a big hit with any Nick fan. You get many of the popular characters including Gil, Goby, Deema, Molly, Bubble Puppy, Nonny, Mr. Grouper and Oona! You also get 2 pieces of neat underwater scenery for a total of 10 fun items! Bubble Guppies is one of the most popular Nick children's shows and these figures are a great way to recreate this neat show! Each nicely detailed mini figure is about 1/2 to 2 inches tall and are made of hard durable plastic. These are for children and adults 4 and older. If you have any questions about this product by Bubble Guppies, contact us by completing and submitting the form below. If you are looking for a specif part number, please include it with your message.